Draft Day or Money Ball, Don't compare the two. I'm sure there will be people out there who will want to compare this movie Draft Day to Brad Pitts movie Moneyball. I really don't know why people love to compare movies to other movies based on a few things in the movie. Moneyball is based on a true story. 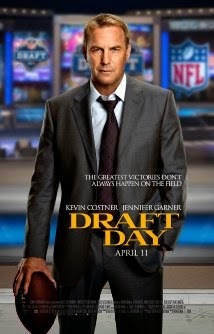 Although Draft Day is a real thing, the movie is not based on anything happening before in life. So that means people are compare a based on real events movie, with something made up. How about we compare Moneyball to The Longest Yard. Both those movies are about sports. See how that doesn't make sense to do. Kevin Costner is the main actor we follow in Draft Day. For Kevin Costner's age, he did pretty well in this movie. It doesn't make sense for him to be with Jennifer Garner because of the 16 year age gap. They both have high end jobs, so shes not there for the money. So really they should have gotten a older lady or younger guy to play opposite parts. Really Jennifer Garner could be opposite a chipmunk and show would be able to pull it off. Jennifer and Kevin were ok as a couple. Most people will see that age difference and think that they wouldn't "work" together in real life, which is true. Older men end up with younger women all the time. Usually because the older ladies are busy couger-ing it up with younger guys. Making all Kevin has left is a younger lady like Jennifer Garner. The excitement in the movie should keep you going throughout. Although all movies have slow parts so the audience can have a break and catch up from what they are watching. There will probably times you will feel like it is going too slow. Just wait it out and it will pick up again. You don't have to be a sports fan to watch this movie. Even if you know nothing about Draft Day or how it works, if you are paying attention you will learn how it works, and should know more about the actual Draft Day by the end. I am a fan of Jennifer Garner, but they really should have gave that part to an older lady. The audience would have agreed with the couple more. Also maybe if she was older, they wouldn't have added a pregnancy into the mix. Hard to believe that a 59 year old man and a 42 year old women would have a baby.